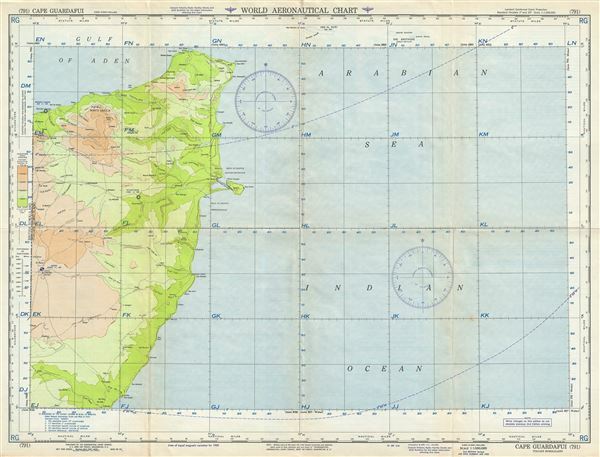 This is a scarce 1952 U.S. Army Air Forces aeronautical chart or map of eastern Somalia. It covers from Haylan south to Il Marodi, focusing on Cape Guardafui or Ras Asir, forming the apex of the Horn of Africa. The chart notes towns, roads, cities, rivers, lakes, topography and other data essential to the air pilot. Verso features legends and a world aeronautical chart index. This chart was published by the Aeronautical Chart Service, U.S. Army Air Forces, Washington D.C., and issued as chart no. 791. First issued in 1944, this is the second edition revised to April 1952.